1st part teaches you how to control "Prana" the life force energy. Once you learn to control Prana everything in creation will gradually come under your control. 2nd part teaches you the "7 Spiritual Laws of Abundance" this helps you to align your life, and live in harmony with natural laws. 3rd part teaches you "GMT." GMT, is the primordial vibration. It is the nature's song, for creating abundance. We can also say GMT is the law of attraction. At the same time the source of everything that we can see, hear, smell, taste, and touch. By practising GMT regularly you will be able to create the right conditions and the set of vibrations in your body. It will fine tune your 'Soul and Mind' and you will generate good vibes. The good vibes will then leave your body and start looking for similar good vibes in the Universe and bring them back to you as a great gift. This is how GMT works and transforms our life. Like a magnet it automatically attracts all good things to our life. The more we sing the nature's song the more blessings we receive. Important: All New Posts Goes Below this Menu. Please scroll down to read. (5) How will it work? ii.How to use NLP Future Pacing to Achieve Excellence in Your Life? iii. How to Use NLP Future Pacing to Excel in Job Interviews? iv. How to Use NLP Future Pacing for Effective Dating? v. How to Communicate Effectively using NLP? Dear friends, it is a great day for me since I am back to writing again! Yes, I am blogging again and I believe ‘Life never stops’. Does it? It is one of the basic principles of this mystical – only because lot of it is unknown to us - universe. And, I experienced it firsthand, last year a lot has happened in my life. I wanted to share it with you, but did not have the determination to do so after I lost my Dad first in February, and then my wife forever in July. They have gone away from this world and me. Life has changed for me; I mean the meaning and my perspective of life. It looks different, sounds, and feels different. I cried, wept, screamed, and felt miserable for few months. One thing I would like to share with you, which is so inspiring, among all turmoil I could still see the Lord. He was there and with me holding my hands as he did from the day, I was born. Also, he made sure his trusted comrades were with me all the while. They made sure that I see the light. I have learned a new way of life. I always believe, and when I say this, I mean it with lot of passion, ‘Nothing ever is going to stop me’. I would not allow anyone or anything from achieving my goal or fulfil my life’s purpose – “Freedom is our birthright and we will achieve it”. When I use the word ‘Freedom’, I mean freedom from all wants, which might take any form either material or spiritual. Our idea should be to attain happiness and perfect bliss. When we gain this, we win real freedom, so folks plan, prepare, and march ahead. Do not look back but do not ignore it either. Life is continual learning. Take good care of yourself and the world. I will be back soon with another piece of thought. It is such a wonderful experience to see the raindrops falling and being greeted by mother earth; it gives me great delight in silently watching our nature in motion. We are having weeks full of rain in England recently, and it has caused real havoc down south. Anyways, let me organise myself, and get back to the mood of connecting with you this weekend. My Dad strongly believed in God, and as I grew up, I also saw a person who lived his life serving others. Though he believed in God, he was not a great advocate of frequenting the temples to earn his share of blessings. He loved his family, and anyone who got in touch with him could feel a difference. He touched everyone’s life he met in a special way. So, I was lucky in a sense to be his son. He was a man of values, and dealt with the events in life steadily with respect. And when I use the word ‘Respect’, I mean he believed everything that happened in our life had a reason, some meaning, and it had a connection to something else. I often heard him saying, ‘Man proposes and God disposes’. Sometimes I felt frustrated and became annoyed when he said this to me, especially at times when I failed to achieve what I wanted. At those times, I remember I used to express my anger and resentment. Strangely, he never showed any emotions, rather had a subdued smile in his face. But as I gained more of life’s experience, I started to realise the hidden meaning of the statement. This week’s exercise is based on the meaning that I have realised. And I would like to invite you to join me to explore it further. (1) Every event that happens in our life has a deep seeded intention. It is manifesting our past intention and desire, and we can physically see and experience it when it is in motion, which we describe as an event or episode. It is our responsibility to understand it, identify the hidden opportunities (messages), and use it to our advantage. The opportunities may be in any form, physical or meta-physical. So, try to understand it, identify the opportunities and use it as best as you can. (2) Practise and try to manage your worries by saying to yourself, “Everything that is happening to me now is for a reason. It has a connection with my past as well as my future.” Gradually, this will help you increase your power of acceptance. Slowly and steadily, you will learn more about yourself, and your real nature. (3) Power of Acceptance will help you to gain control of the future. You will gain the power to control your own destiny. But it will only happen when you accept yourself ‘as you are now’. (4) Do not resist because it would seem futile challenging the laws of the Universe. Cecil B. deMille observed, “It is impossible for us to break the law. We can only break ourselves against the law.” So, identify the hidden opportunities (messages) in every event, and use it to your advantage. This will lead us to our destination (destiny) safely. In this article, we will briefly examine ourselves; explore what the term ‘Success’ means, and how the Pain-Pleasure Principle governs it. In general, success means to achieve something attempted or in other words experiencing a favourable outcome. We can say success means reaching our goals and desires. When we achieve our goals or desires, we experience a pleasurable state of mind, and that makes us feel good, and we feel satisfied. On the other hand, when we fail to achieve our goals and desires, we experience pain and dissatisfaction, which affects our mental state and therefore our quality of life. It is a natural instinct in living beings to avoid pain and sufferings, and seek pleasurable states. This idea is governed by a powerful natural law called the Pain-Pleasure Principle. The Pain-Pleasure Principle is based on sensory perceptions. We use our sensory organs such as eyes, nose, tongue, ear, and skin to make meaning of the energy and information in our environment. We experience pain or pleasure depending on how we interpret or decode energy and information in our environment, and our interpretations influences our actions. In our natural state, all of us use this principle without even realising it. We are easily attracted to anything that gives us pleasure, and any painful state is instantly rejected or avoided. Though we use this principle routinely, we must understand and examine the principle closely by bringing it to our conscious awareness. It is important because all our decisions do not lead to a pleasurable state. Let me illustrate this with an example, people smoke cigarettes to get some pleasure and avoid pain. Does it help them? Smokers may experience a momentary pleasure or relief but we know in the long run they suffer from the adverse affects of smoking. So we can say all decisions driven by momentary pleasure may not lead to a favourable outcome. Human beings have the faculty of choice, so we can choose what we want in our life. If we become conscious on the way we use Pain-Pleasure Principle, we will make wise decisions after properly examining the outcome. So, next time you set a goal and commit yourself, think how you are going to achieve it? And what are you going to get as an outcome? Take a pen and a blank piece of paper, write down 10 things you rejected or avoided today to be happy. Write down what comes to your mind naturally. Once you have your list, examine them by thinking deeply, and now write down what you wanted to have instead. This simple and powerful exercise will help you to concentrate and focus on the way you make decisions. If you use it, you will feel re-energised, have better control on your life, and you will also increase your capacity to make informed decisions. We will cover this topic in greater details soon in our ‘Vedic Coaching Programme’, and I will keep you informed through this blog. Take care and God bless! I want to share with you a beautiful story of a child and his conversations with God. My wife received this inspiring presentation from a friend through e-mail. And I want to give this to all the wonderful mothers in this world. Before I begin, I would like to apologise for not keeping my promise. I was down with chicken pox and was not doing well. So, I could not publish the first part of the special programme based on Vedic Technology. But I must tell you that I am working on the project, and I will be able to present it to you soon. At that moment, there was much peace in heaven, but voices from earth could already be heard. Hurray! I think I am getting back to my old form and I have started writing some meaningful stuff. I hope by the end of this week, I will be able to publish the first part of a life-changing programme based on 5000-year old Vedic Technology. I am sure you will hold your breath! But I promise not for long. Anyways, to keep you busy I will re-introduce you to something extraordinary in this article. It is a simple but powerful technique of self-discovery and progress. So, what is it? It is the art of self-assessment and evaluation. It is the way we ask and question ourselves. Have you ever paid attention to something, which always talks to you? It is our inner voice. And it is an automatic process, as it talks to us intelligently without our active intervention. It just happens. Do you know how and from where it happens? I am sure all of you have experienced your inner voice. But have you ever questioned: whose voice is it? Is it an inner being that is talking to you? Is the inner being and you the same entity? And how do you discover the identity and nature of that inner voice? I would not write anymore on this topic now, as I want you to go back and reflect in your leisure peacefully and quietly. If you think deeply you might see something extraordinary happening to you. Do let us know about your experience. Take care and God bless you. This is the first article I am writing after my Baba (Dad in my native language) passed away in India on the 28th February 2007. I am thankful to all of you for supporting me by sending emails and leaving messages in the blog filled with love and compassion. I went to India for the funeral and other ceremonies, and it did go very well. Though it was quite a demanding process as Hindu, i.e. the Vedic rites are time consuming. But I feel better now; being the only son, I have done my father’s last rites. There is a strange feeling though. And I must say it is a good feeling. When I think I have followed the footsteps of my ancestors, which has been going on for thousands of years in India. After I came back to England, I have received lot of support from my friends and colleagues. So, I am grateful to God to have you all with me, as my extended family. Today, I want to present to you a great piece of text, which I received, from one of my colleagues. It touched my heart and left a mark on my Soul. “Death is nothing at all. I have only slipped away into the next room. I am I, and you are you. Whatever we were to each other, that we still are. Call me by my old familiar name, speak to me in the easy way which you always used. Put no difference in your tone, wear no forced air of solemnity or sorrow. Thank you, I will try to get back to my old routine soon, and publish more articles. God bless you all. My Dad passed away and I am going to India for the funeral on 8th March. Just to let you know that I won't be writing for a while. The Law of Dharma has three main parts and we can see them in the success equation given below. In this exercise let us do something different and interesting. Let us explore and examine whether we can apply this principle to Bill Gates’ life. Isn’t it exciting? (1) Did he identify his unique talents? - He was passionate about software programming, and from a young age he use to spend hours writing computer programs. - He knew that he could succeed using his unique talent. He is a man of great vision. - He knew that he could revolutionise and change the world of computing. - He also knew that he could touch other people’s lives in a special way using his unique talents. - He believed in himself. (2) Did he nurture and develop his talent? - He knew computer programming was his unique talent. So, what did he do with it? - He took massive action. He was 100% committed and he used his skill to create abundance. - He worked hard and stayed focused on what he wanted to achieve. - He created a map for his life’s journey. - He continually developed and improved his programming and marketing skills. - He partnered and networked with people. (3) Did he identify the unique needs of others and serve them elegantly? - He found out there lies a huge opportunity in computer software industry. - He envisioned that computers would revolutionise the society. He realised the power of personal computers, and used his unique skills and talents to develop the famous Windows Operating System and the Windows Office tools. So, did he know about our unique needs? I am sure you would agree he did. Did he serve them elegantly? Yes, he made it easy for us to use a computer through the special Windows Graphical User Interface. We have explored Bill Gates’ life using our success equation, let us ask ourselves the following questions: What happened to him when he applied this equation? Did he succeed? Did he realise his dream? Did he create abundance? Did he make a difference to our lives? Now let us take some time and visualise about our own life. Then, take a piece of paper and a pen, and write down the success equation. And identify and apply each part in your life. Please share with us what happens next. Take care and may God bless. Sometimes I feel and say to myself, I wish there was more time in a day. I work full-time in a secondary school in England and my responsibilities besides teaching include line managing as I lead the ICT department. I also have my personal commitments, and I love writing, as it is a way of realising my full potential and connecting with all of you. I am passionate about it. I also need to find time for my life coaching. So, I find the balancing act challenging at times. Managing our time in this fast paced world is a real problem. Isn’t it? I am sure all of you have busy schedules and have various types of responsibilities and face similar problems in managing your time. So, how do we manage our time in a better way? Let me share with you a simple idea, which I came across a few years ago, and I found it amazing as it works wonders if we can apply it creatively. Philip Dormer Stanhope Chesterfield says, "I recommend you to take care of the minutes, for the hours will take care of themselves." So, What did I do with this simple idea? (1) I plan and I have a schedule for my whole day. I break up the day into small manageable chunks. I remain flexible, as I know I may have to deal with any unforeseen events. (2) I say to myself whatever I am doing at this minute I will do it to the best of my ability. I will apply the One-Minute principle. (3) I also say to myself, I am happy every minute, as I know if I am happy every minute, I will easily remain happy for the hour, and eventually it will help me to remain happy throughout the day. It works for me, so you can try to see if it works for you. I have also found, by simply saying and acting as if I am happy this minute makes a big difference to the state of my mind. So, whatever your role is at this minute Mom, Dad, Grand Mom, Grand Dad, Homemaker, Cook, Cleaner, Manager, Business owner, Lawyer, Teacher, Doctor, Sales personnel or any other role, please apply this principle and make effective use of this minute. And see for yourself what happens to the hour, and if possible please share your experience with us. How do we feel when we are angry or when we carry an internal grudge against someone? Certainly, we do not feel comfortable. Do we? We know that we live in a materialistic world and we cannot deny or avoid its influences. And sometimes we face events in life, which affects our mental equilibrium. Anger is a killer and we know from scientific evidence that it can cause serious damage to our system. According to various spiritual scriptures, ‘Anger’ is not a normal part of our human nature. And through regular practice, we can form a habit to ward off this external element from reaching and manifesting our system. Let me share with you a beautiful Buddhist story on anger management told by my grand mom when I was a little boy. The monk immediately realised what the teacher meant, and it opened his eyes. So, he vowed to his teacher and thanked him for the advice. In future, whenever the monk felt angry, he recalled what his teacher has said to him, and that helped him to gain full control of his mental state. Before I close, I would like to ask you to take a moment and think, is there anything that we can gain from this beautiful story? Take care and may God bless you. Catch you soon! How many times you had a fantastic idea in your mind, but you stopped yourself from pursuing it? And later, you found out that someone else has acted on a similar idea and achieved a great deal. So, what is the difference between you and the other person? When you look back, you realise that something powerful stopped you from taking action. Sometimes we think more about what other people are going to think about us. Are they going to accept our idea? Are they going to be too critical about it? Am I doing it right? Am I going to embarrass myself? Did these questions ever arise in your mind? I am sure you will agree with me that we have all experienced this inner voice. One part of our self-says that we can do it, and at the same time, the other part says that we can’t. It is like an inner tug-of-war. We need courage and determination to overpower the part, which says we can’t. If we think deeply we will find that we often focus more on the external elements rather than looking inside. We become object referral rather than self-referral. We become easily influenced by external stimulus. What happens when we do that? I am sure by now you have already got the message that I am trying to send to you. Please stop reading and think for moment. Can we make progress in our life and achieve excellence if we always worry about what other people might think about our actions? Can we satisfy everyone? Or should we reinforce our inner strength and courage by focussing on our goal rather than focussing on external event? What can we learn from this beautiful message? Would it be a good idea to think how we can apply it in our day-to-day lives? As I write this article, an interesting story suddenly came to my mind, and let me share it with you. The story is about Robert Fulton the man who invented the steamboat. After completing his dream project Robert Fulton wanted to display his invention to people in the Hudson River. So, many people gathered on the riverbank to see how the steamboat works. When the boat was ready and about to begin its journey the critics and pessimists commented the boat wouldn’t move at all. To their surprise, the steam engine propelled the boat and it steadily moved forward. Now, when they saw the boat moving they started saying, “Though the boat is moving forward, it wouldn’t stop.” Great views, isn’t it? So, what do we learn from this story? And what should we do to move ourselves forward despite all the external influences? (2) Create a plan of action. (4) Stay focussed on your goal. (5) Trust your inner self. (6) Do not share your goals with too many people. (7) Lead life based on sound universal principles. (9) Choose your companions carefully. (10) Think how an external stimulus can help you to move forward. If it does not add value, ignore it sensibly. (11) Develop and follow a programme of continuous development. Have you ever thought how we treat ourselves? Do we talk to ourselves with love and care? Do we show enough respect to our self? Let us take a moment and think what we do when we make a mistake or do not get the desired result? Do we tell ourselves off? How many times do we call ourselves ‘Stupid’ or use a similar word to express our dissatisfaction? If we think about these questions deeply then we will discover that often we treat ourselves unfairly. And when we do not treat ourselves properly, the world treats us in the same way. I had this bad habit myself. Whenever I made a mistake, I used to blame and curse myself, and carried a feeling of guilt with me. What happens if we do this? First, our subconscious mind accepts whatever we say as true. If we say to ourselves, we are not good at doing something. Immediately our subconscious mind receives this message and records it as true; because it does not judge any statement, we make. When I realised the way we talk or communicate to ourselves decide the quality of our life and our effectiveness, I changed my approach. I desperately wanted to break free from this never-ending cycle. So, what did I do? When we talk to ourselves positively, we send positive feedback or message to our brain. And this reinforces our action and our experience. On the other hand, if we talk to ourselves with a negative tone, we send a negative feedback or message to our brain. And we tell our brain that we are a failure and this further reinforces and records the negative experience. Whatever feedback we send either positive or negative is recorded in our brain. It is like a solid mark in a piece of paper. So, if it is negative it remains like a scar in our mind. And this has a massive impact on our behaviour, confidence, and self-esteem. That is the reason we doubt ourselves in doing certain things in life. We form a fear of doing something, if we have failed in the past, and record that experience as a negative one, and our internal self-talk process further strengthens it. It is important that we pay attention on how we communicate with ourselves and get rid of the habit of sending negative signals to our brain. Sometimes it may become a real challenge for us to try to change our habits, which have formed from many years of negative reinforcement. So, how do we change and form a habit of positive self-talk? I would like to share with you some simple ideas, which I have used in my life to cut through the never-ending cycle of negative self-talk. And let me also tell you the truth, despite my practice I still fall prey to this cycle. So, it is a constant battle. But as soon as I realise I am going the wrong way, I fiercely bounce back. (1) From this moment, unconditionally accept that it is all right to make mistakes. We always learn through our mistakes. For example, babies learn to walk by making mistakes. There is no Failure in Life, Only Feedback, or Outcome. Remember, we always succeed. Say it to yourself, ‘We always succeed in getting a result’. Sometimes we get a result, which we did not want (we call it failure), but still it is only a result. So, whatever happens in our life is only a result or a feedback. If you do not like the result, learn from the experience, change your approach, and get a different result. If you still do not like the result, change your approach again till you get what you want. (2) Watch carefully how you talk to yourself when you face any event in life. Remind yourself about this principle. (3) When you realise that you are sending a negative message to your brain stop it immediately. One interesting and powerful technique is to say to yourself: STOP! STOP! STOP! Say it as loudly as possible inside your mind. After that, immediately replace it with a positive statement. For example, if you were saying to yourself, ‘I am not good at remembering names’. Immediately replace it with the positive sentence, ‘I am good at remembering names’. This process is called the self-talk interrupt process. Make sure your new sentence is a positive one, and it is in the present tense. Do not worry if the statement is not true now. When you start repeating the statement consider them as true, and act accordingly, you will soon realise that they will come out as true. That is why this moment is called the present. The principle of Present Moment Awareness simply means to become more powerful and effective with whatever we do in our life by focussing all our energy into that moment. Anthony Robbins, one of the world’s top motivational speakers says, “Controlled focus is like a laser beam that can cut through anything that seems to be stopping you.” The idea is simple: Harness the massive power of human mind effectively. It is the power of our concentration, which makes us great. All great men and women mastered the power of concentration to become effective in their field. Their devotion and cent per cent commitment made them great. To achieve ‘Controlled focus’ we have to discipline our mind through constant practice. Just stop reading for a moment, close your eyes, and imagine what would happen to your life if you did every little thing effectively. Please think about it deeply, for a moment. And this can only happen when we decide to focus all our attention to the present. We can then become highly effective and we will experience our unbounded self. By ‘Unbounded self’, I mean the massive power that is hiding inside all of us. It is the ‘Prana’ or the life force energy, which governs everything in this Universe. Now let us do a simple exercise to reinforce our understanding of the present moment awareness and experience the ‘Power of Now’. You are doing something now, isn’t it? You are reading this article. Watch your mind for a moment and see if are 100% focussed. Are you thinking about any other thing while reading this article? If you are, then your mind is not 100% focussed on reading this article; obviously, it is wandering somewhere else. Now our duty would be to stop the ‘wanderer’ and consciously bring it back to this moment, remember you have to use your mind to do that. Isn’t it interesting? In other words, you will use your mind to gain control of your mind. Do not worry if you find it little confusing at the beginning. It will become clear to you as you practise it regularly and you can apply this technique throughout the day. If you commit yourself in applying this principle, you will notice a massive positive change in your life within a short time. This concept is simple but immensely powerful. Remember human mind is extremely powerful and it loves wandering. It has a natural tendency to run wild if we do not hold the reins properly. According to the Vedas - Veda is the powerhouse of knowledge that evolved in India for more than 5000 years - if you want to gain control of your life and create your own destiny; the first step is to watch your mind. So, what happens when you watch your mind? An instant evolution takes place. You see and experience it for yourself how your mind behaves and reacts to various events in life. What happens when we know how our mind behaves? When we know how our mind behaves, we are in a better position to manage and control our mind. When we carefully watch our mind, we also realise that most of the time we unconsciously allow our mind to wander. When we do not control our mind, it does whatever it wants. It takes full control of our body and our soul, and therefore controls our actions. And if we allow our mind to become the king, it soon becomes unruly, and in the long run, we suffer from the adverse effects. We know from scientific research as well as our personal experiences that thoughts and feelings have a direct affect on our body. So, if we manage our thoughts and feelings effectively it will have a massive impact on the quality of our lives. A human being is the sum total of mind, body and the soul. Human being = Mind + Body + Soul. The ‘Soul’ or the ‘Self’ is the real master of the other two parts that is mind and the body. When we allow our mind to run wild like a mad elephant, the Soul or the Self-loses it’s supreme glory, and the result is suffering or pain. But if we can gain control of our mind, we can use this powerful tool to achieve whatever we want in life. So, the idea is to use the power of the mind to tame the mind. And this can only happen through constant practice. Raja Yoga provides sophisticated tools and techniques to manage and control our mind. Yoga simply means balance that is balancing the mind, body, and the soul and reaching an equilibrium state. I have found that ‘Hatha Yoga’ or the physical yoga exercise is more popular in the West. But Raja Yoga, which deals with the management and control of the mind, has often been sidelined. 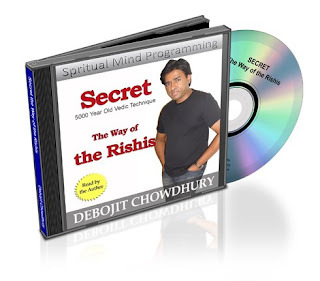 In this programme, I will introduce you to various tools and techniques from Raja Yoga that will help you to gain total control of your life and unleash the massive inner power that is hidden inside each individual. We will learn how to increase our energy, which is vital for performing at a peak level. So, when you consciously watch your mind, you will notice an interesting fact that most of the time we live in the past or in the future. And both the states i.e. past and the future do not exist. This means we may be doing something in the present but we are not fully present in that moment. We either think about something, which has happened in the past, or we think about something, which might happen in the future. We lose and waste much energy by doing that. We have to keep in mind that thoughts are nothing but energy. Our thought consumes a huge amount of energy. All great discoveries and inventions such as steam engine, light bulb, aeroplanes, rockets, and space ships, computing technologies were only a thought in somebody’s mind at a point in time. So, thoughts decide our destiny, and a thought consumes a huge amount of energy. We know from our experience that when we do mental work, we spend energy, and that is the reason we become tired that is our energy level decreases. Proper management of our energy is the key to effectiveness. We know that we cannot become effective if we are not 100% focussed in the present. Can we? Just imagine that you have gone to an important meeting. What would happen if your level of presence and commitment were 50% that is the other 50% of your mind is somewhere else? Will you be able to give your best and perform convincingly? Will you succeed? These questions apply to every event in your life. If you ask these questions in whatever you do, you will experience the massive universal power of the present moment. Yes, it is hard, it needs commitment, and we need a continuous programme to apply these principles effectively. And we have to pay a price. ‘Paying a price’ is another interesting principle, and I want to say something about it right now. We pay a price for whatever we do in your life. So let’s say if I want to become an effective person I will have to pay a price, and that’s a natural law. If I am not ready to pay a price now to become effective, then I have to prepare myself to pay a price by suffering later. So, we have a choice? Isn’t it? We have to decide which is right for us. How to practise Present Moment Awareness? Now we will look at few simple but powerful techniques to practise and apply this principle in our lives. (1) Watch your mind when you are doing something and observe carefully whether it is deviating from the right path. If you notice that it is wandering use your mind consciously to bring it back to the right track, use it like a steering wheel of your car. Our mind is only a tool, which is directed by its master i.e. our Soul. (2) Practise it regularly. It does not happen in an instant so you have to be patient and diligently apply it. The more you apply the better you will get. (3) An easy way is to talk to yourself and remind your mind what you are doing at each moment. Let me tell you what I do, and these examples will help you to make a good start. I would suggest that you begin your practise with the simple ones, and then you can add more to your list. (a) For example, when I am taking a shower, I say to myself, ‘I am enjoying the water falling on my body and I consciously experience every little sensation’. Believe me it is amazing. You can try it yourself and see how you feel. (b) I will give you another example. When I walk down the stairs, I just say to myself, ‘Now I am walking down the stairs, I am right here, and I consciously experience it with my mind’. I say to myself, ‘I am enjoying every moment’. (c) Another example, when I am eating I remind myself of that moment; I focus only on eating, and enjoy and relish every moment. I ward off any other thought. Try this yourself and share your experience with everyone. (4) Proper breathing is vital for leading a good life. Make sure that you breathe properly, and you watch your breathing patterns. Do you inhale and exhale properly? When you concentrate in your breathing you will gain great benefits and it will also help you to focus your attention to the present moment. I would tell you more about effective breathing practises for creating high-energy level in another article soon. I would like to end by saying that when you practise and apply these principles, please do not expect results overnight. Give yourself enough time so that you can form the right habit. This article is only an introduction to thought control and management. In coming weeks, we will focus more, and go into depths to gain an understanding of this area. Take care of yourself and may God bless you.